Vinod Mehra was an Indian actor who performed in Bollywood films. He worked in over 100 films from the 1970s through to his death at the age of 45 in 1990. He is best remembered by the public for his roles in the films Jurm Aur Sazaa, Bindiya Chamkegi, Maujaan Dubai Diyaan, Aap Ke Saath, Pyar Ki Jeet and Parde Ke Peechey. Mehra was also the producer and director of the film Gurudev which was released 3 years after his death in 1993. Born on February 13, 1945 in Amritsar, India, he has an older sister named Sharda. He began his career as a child actor in the late 1950s before starting his film career as an adult in 1971. He was married to Kiran, Meena Broca, Bindiya Goswami and Neeta Mehta. His daughter, Soniya made her Hindi film debut in the 2007 film Victoria No. 203, a remake of the 1972 classic film of the same name, and his son, Rohan made his film debut in Nikhil Advani’s film Baazaar (2018). He died of heart attack in Mumbai at age 45. 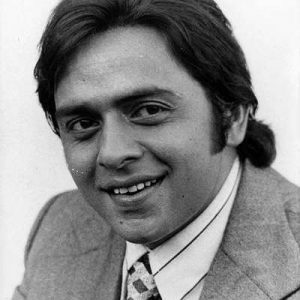 *He was born on February 13, 1945 in Amritsar, Punjab, British India. *He was just 13 years old when he made his first film appearance in Ragini as a child artist. *His son, Rohan Vinod Mehra is an actor/director. *Rohan was yet unborn, when Mehra died of a second heart attack on 30 October 1990. *He confirmed his marriage to Rekha in a interview to Movie Magazine (October 1990).